Tape storage is, in some sense, the most successful technology across all of IT, being first used in the 1950s and AFAIK still unbeaten today in its niche. Though the success is mostly because tape can be wound up so compactly, it also seems to be intrisically quite good to handle – unlike with big drums or disks, you don't need to carefully align the heads on a huge surface but can just let a small part of the tape come to the fixed head. And at any rate, the tape head technology had been well optimised since the beginning of audio recording. Yeah, sure tape is also famous for its rip- and knottability, needs careful alignment too etc., but I think we can say it's an overall very good medium. Spooled-up tape has the obvious problem of access time, which has always pretty much confined it to backups only, however that's not the only way to operate a tape – it's also possible to close the tape to a loop, so each part periodically passes the head. This isn't only theoretical, it has been the standard way to achieve echo in audio production. And we might actually say that a drum storage is nothing but a bunch of closed rigid tape loops in parallel, so if drums worked well for storage then tape loops should have worked well to. Except they would presumably have been cheaper, and the loops could be made much longer than a drum circumference, to trade in latency for capacity – at arbitrary ratio! This would certainly not have been as cheap as spooled tape because to get really high capacity you'd still need multiple loops, each with its own head. But that too is actually something that was done in audio, in the Mellotron. At least after audio cassettes became a consumer mainstay, the heads should have been cheap enough to make this viable. Because a closed tape loop doesn't buy you anything in random access latency, which is presumably the problem you're trying to solve. The problem is that large tape loops, like 8-track, only can wind one way. So on average, you need to wind the tape halfway through to get to a random piece of data. The worst case, you wind the entire tape. Random access tape (IBM 3570 and the canceled LTO Accelis) keeps the tape at the midpoint by default. So in the average case, you wind a quarter of the tape, in the worst case you wind half the tape. This is a 2x improvement. If you have a bi-directional tape loop, you can avoid this, but then you have a density problem because the tape is no longer wrapped in a spool, but on a series of rollers. The fundamental problem with tape is that in order to get decent transfer rates, you need to move the entire reel of tape very fast, which is difficult, or spin the heads independently of the tape (helical scan), which brings its own set of alignment issues. A 7200 RPM hard drive gives you >20 m/s linear velocity, exceeding tape (~7 m/s for LTO). Once you have the tape moving, the heads are contacting the medium, so it will wear out with every pass. Back when we used helical-scan DDS tape, it was rated for 2,000 passes, requiring 10 passes per read, so the tape was only good for 100 full read or write cycles. Hard drives heads float on an air bearing, making their lifetime much greater and giving a much more stable head-disk interface. Because there's very little friction in the system, you can very precisely servo the heads to a track. Tape doesn't let you do this. The best tapes today (LTO-6) give you about 13,000 tracks per inch, where as hard drives exceed 400,000 tracks per inch, a 30x increase. They were used, but suffered from latency issues and complex electro-mechanical design challenges. Their brief day in the sun was around the mid-1950s: after that, it was likely cheaper to add another drum or disk platter rather than work out massive tape-loop logistics. Later home-computer tape loop systems, such as the Exatron Stringy Floppy and the Sinclair Microdrive, only came into existence after floppy drive technology had been developed. They were only viable while they offered adequate performance for a far lower price than add-on floppy drives. Once floppies were cheaper, tape loop drives were quickly forgotten. The University of Strathclyde had a large fleet of Sinclair QLs that it loaned to its students. These were perhaps the only machine that initially relied entirely on Microdrive tape loops. The pragmatic approach to unreliable tape media was to encourage students to buy more tapes, format them, and return the unreliable ones for refund. Since Microdrive tapes stretched as they were used, their capacity increased up to a generally stable value. Accepted practice at the time was to format tapes up to 10 times using a FOR loop in SuperBASIC. If a tape stayed at the same capacity over the first few formats, it was likely to be reliable. If, however, the capacity kept increasing it meant that the tape was likely to break and that particular cartridge should not be used. unlike with big drums or disks, you don't need to carefully align the heads on a huge surface but can just let a small part of the tape come to the fixed head. Not really. that's maybe basic use of today – and what modern tape systems are optimized for. But there was a time when tape drives were a major component of external storage. In many cases the only one. If at all, disks where used for OS and software and maybe paging. All data was done with tapes (*2). The heydays of tapes as main data media lasted through the whole 1970s with the IBM 3420 as cornerstone. A 3420-8 (the top model in 1973) could read, write and seek data at 200 inch per second at 6250 bpi - which, at 9 track was also a byte. This gave a raw speed of up to 1,25 MiB/second. A maximum sized spool of 2400ft could hold 100..130 MiB (depending on block size) and be read/written/seeked in about two minutes. Pure rewind was even shorter at ~45 seconds. Further, blocks could be read in either direction. These tapes were not meant as backup, but work media. Usually not the tape, but the mainframes CPU and application speed was limiting throughput and when used for disk backup, the tape had to wait for disk seek. These tapes were blockwise rewritable (when keeping the same block size). From an applications view the differences to disk drives where rather minor - when keeping the tape nature in mind. however that's not the only way to operate a tape – it's also possible to close the tape to a loop, so each part periodically passes the head. This isn't only theoretical, it has been the standard way to achieve echo in audio production. And as well for cheap microcomputer storage with the stringy floppy and its most well known incarnation, the ZX Microdrive. A bit like the floppy story, as mainframe drives were far ahead. Except they would presumably have been cheaper, and the loops could be made much longer than a drum circumference, to trade in latency for capacity – at arbitrary ratio! Beside that the fact that it has been done, that there is no speed gain. Bottom line: What you wanted to do with loops was already achieved with standard tapes. They were a great storage (when used right), but did need exceptional effort to do so - and modern backup ones aren't in line with these requirements. *1 - The Wiki got a rather good explanation of the workings in their 9-Track-Tape article - even though it's tied to a medium speed drive with vacuum chambers, but a conventional capstan. *2 - I remember several customers who even in 1980 refused to switch for disk storage. The mainframe could be booted from tape and as data storage tapes could work at similar speeds as disks. Given a useful data organization ofc. Closed tape loops may not have been popular, but they were used occasionally. 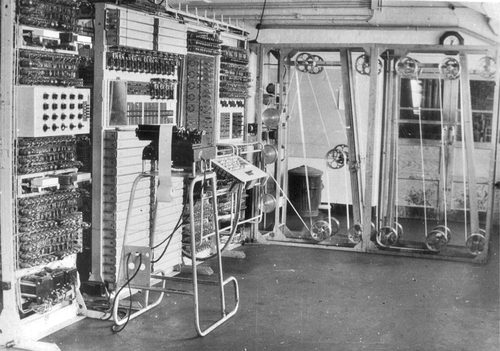 One of the first computers, Colossus, used a paper tape loop for read-only data storage (the ciphertext to be decoded was stored on the tape). This tape was stuck in a loop and driven at high speed (~45 km/h) past an optical reader. Keep all of the tape perpendicular to the same plane, and add enough rollers that the tape never has to wrap against itself. This approach works well for things like tape echo units that have only a few seconds of tape, if even that much, but quickly gets bulky and unworkable for handling larger quantities. If tape were stored in a cartridge that's 4cm on a side, it would be necessary to have about ten rollers for each meter of tape. Perhaps not a problem if the loop is short, but a big problem if it isn't. An advantage of this approach is that the tape can be kept under tension. Have the tape loosely coiled up in the cartridge around a spool, and pull tape upward from the middle. This approach can work (it's how 8-track tapes are constructed), but it requires that the tape slip against itself in the cartridge (causing excessive wear) and is prone to have problems if things don't wind and unwind themselves just right. To achieve good reliability and capacity in a tape cartridge, tape needs to be coiled and uncoiled while staying in a common plane. Non-looping cartridges can do that. Looping cartridges may allow for slightly-simpler recording/playback equipment, but their downsides are too great to make them particularly competitive with other technologies. Milton Bradley's (MB) OMNI Entertainment System was an electronic quiz machine game first released in 1980, similar to Jeopardy! or later You Don't Know Jack video game series, using 8-track tapes for playback analog audio for questions, instructions and answers as well as digital signals in magnetic tape data storage [emph. mine - LeoB.] on remaining tracks to load the right answer for counting the score. In 1978, the Mego Corporation launched the 2-XL toy robot, which was similar. So, formally, there was a popular storage medium made of a closed tape loop which was used as data storage, albeit not for computing-related applications, and read-only. "Microdrives used tiny (44 × 34 × 8 mm including protective cover) cartridges containing a 5-metre (200-inch) endless loop of magnetic tape, 1.9 mm wide, driven at 76 cm/second (30 in/second); thus performing a complete circuit in approximately 8 seconds." The former ZX owners would tell you stories about how unreliable these tapes were. Compared to audio compact cassette players (TRS-80 ! ), at least you didn't have to press the play-stop-forward-reverse-record buttons. Not the answer you're looking for? Browse other questions tagged magnetic-tape or ask your own question. What DOS software can I test a QIC-02 tape drive with? Which tape drives were the last to offer backward compatibility with QIC-150 Tape Cartridges?